Product prices and availability are accurate as of 2019-04-22 15:59:59 UTC and are subject to change. Any price and availability information displayed on http://www.amazon.com/ at the time of purchase will apply to the purchase of this product. 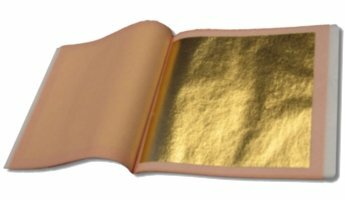 This double gold leaf is thicker than the regular gold leafs. The leaves are placed in paper booklets, loosely inlaid in 5 compartments, one for each leaf. To cut the leaf, one may take it from the booklet with the gilding knife and place it on the gilding cushion or drop it directly from the booklet onto the gilding cushion. Then, pick up the leaf with the gilder's tip and place it onto the prepared surface. (SHIPPING METHODS) We ship USPS. Naturally we always forward a tracking number to each buyer as soon as the package ships out. An average transit time is 4 days however we do not guarantee it as it is beyond our control and varies depending on your location. Phone number required helps to ensure a smooth delivery. If you absolutely cannot provide us with your street address please contact us prior to making your purchase to discuss possibilities. Please feel free to message us with any questions and concerns! 24k Double Gold Leaf Transfer Type 5 Sheets Dimensions: 3 1/8" x 31/8" FRAGILE PLEASE USE CAREFULL!! !